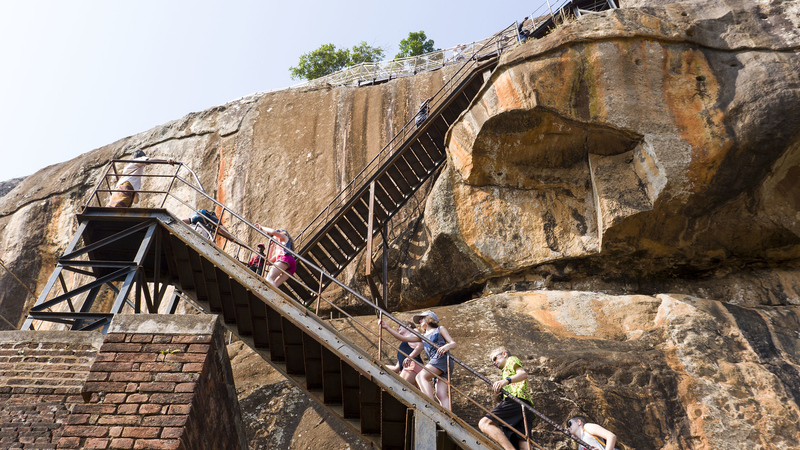 An unforgettable experience climbing to the top of an ancient rock fortress. 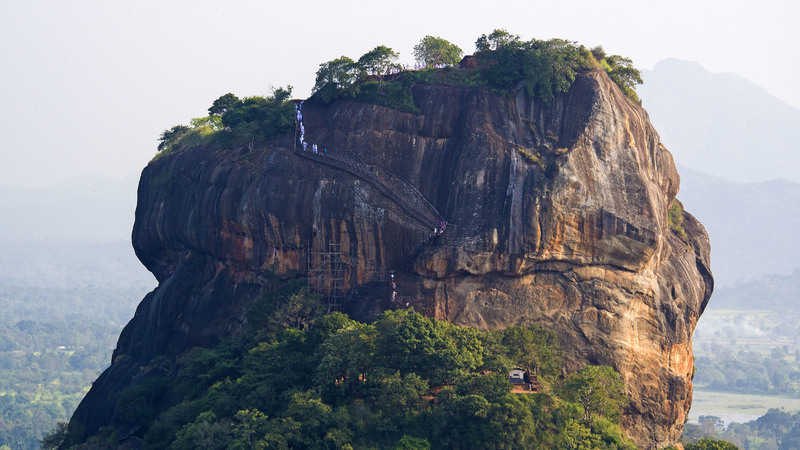 Sigiriya Rock is one of the most visited attractions in Sri Lanka. Once you see it in person, or even in photographs, you’ll quickly realize why. Referred to as “the eighth wonder of the world”, it’s as rich in natural beauty as it is steeped in history. The Ancient City of Sigiriya is recognized as a UNESCO World Heritage Site. 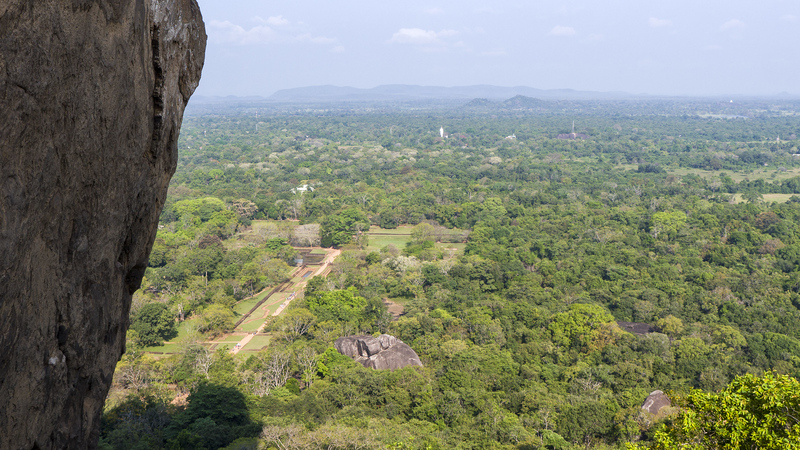 I’m going to tell you a little bit about the history of Sigiriya Rock and my ascent to the top. I’m hoping that by the end of the article, you’ll want to hop on a plane and travel immediately to Sri Lanka. 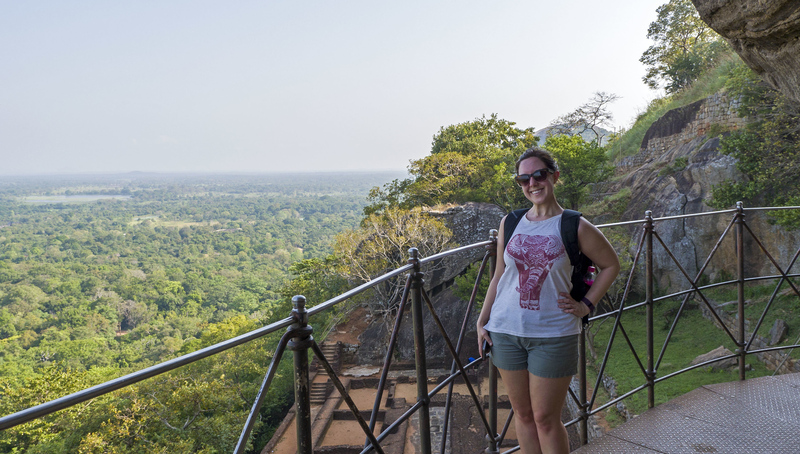 As I write this and relive my experience at Sigiriya Rock, I’m already thinking about going back someday. Have you ever felt accomplished after a hiking or climbing experience? Tell me about it! It’s really a unique rock formation, isn’t it? I haven’t seen such a massive single column of rock in my life. 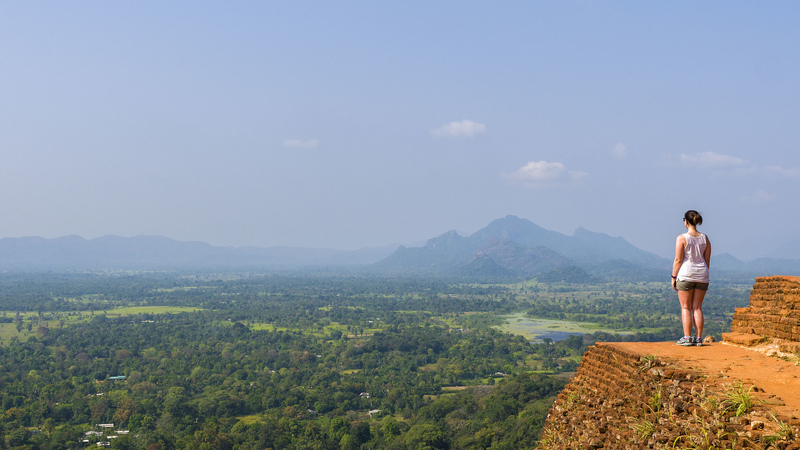 Sigiriya Rock rises 200 metres above the surrounding jungle with a flat plateau on top. It formed from the magma of an extinct volcano over 200 billion years ago. 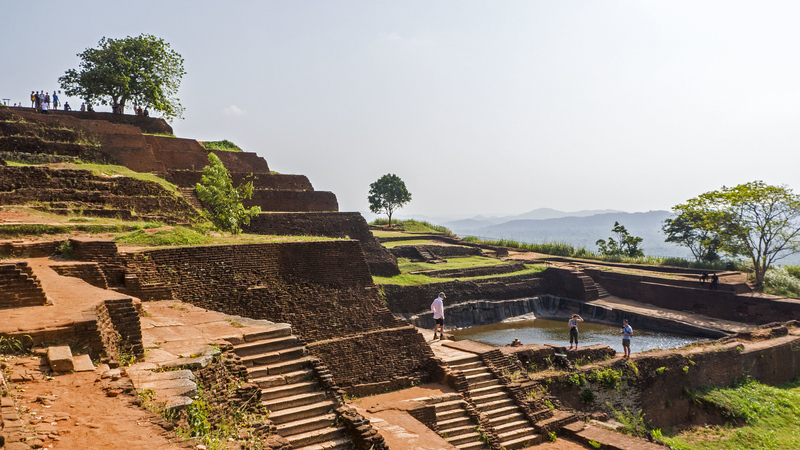 Today, Sigiriya is one of the world’s best examples of ancient urban planning. After all, the Sigiriya rock fortress was built over 1500 years ago. There’s evidence that the area surrounding Sigiriya was inhabited in prehistoric times. 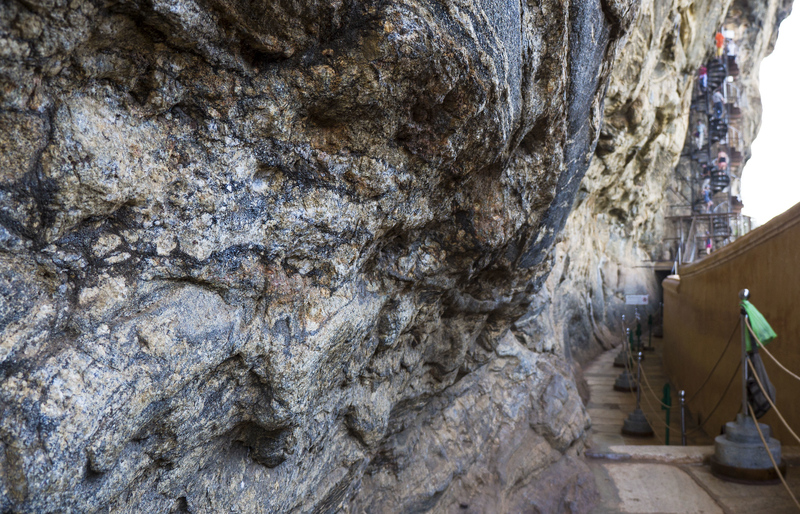 Buddhist monks inhabited the rocks and caves as early as the 3rd century BCE. 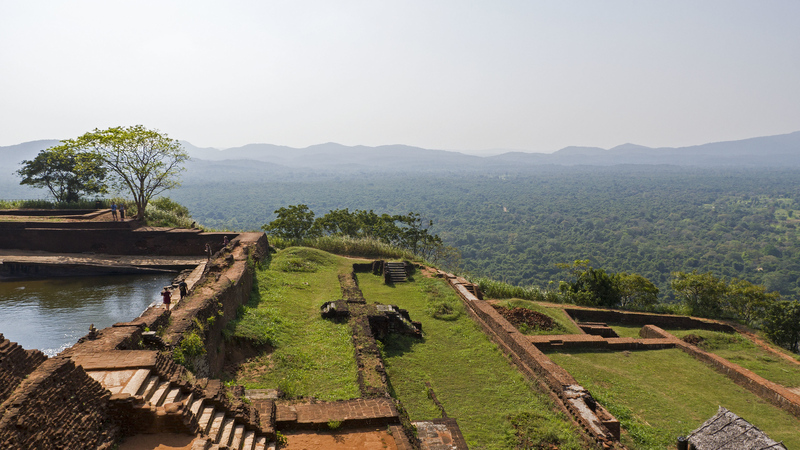 The fortress at Sigiriya rock developed following a power struggle between two brothers. In 477 CE, Kashyapa murdered his father, King Dathusena and seized the throne. The rightful heir to the throne, Moggallana, feared for his life and fled to South India. 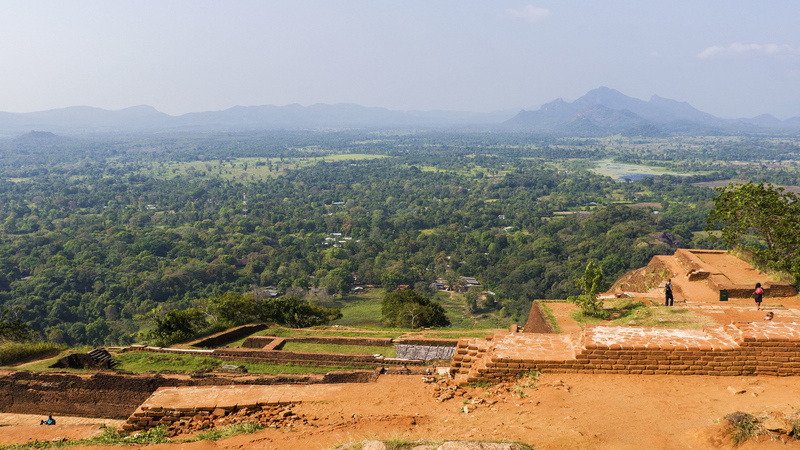 As King Kashyapa feared his brother’s retaliation, he moved the capital city to the more secure site at Sigiriya. 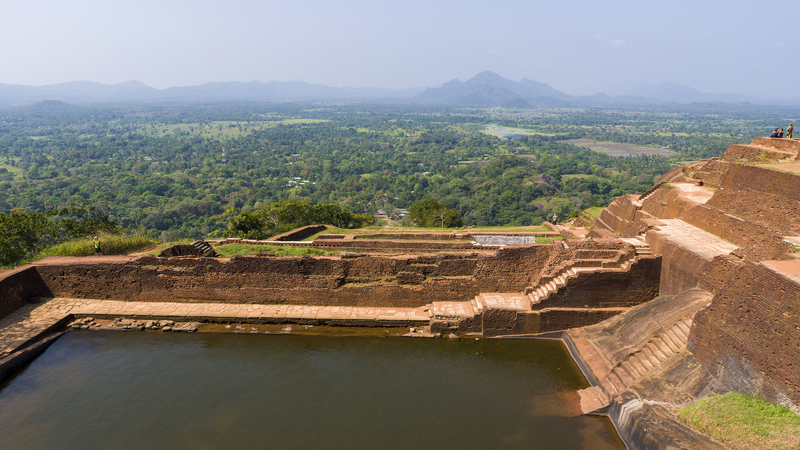 During King Kashyapa’s reign from 477 to 495 CE, he developed Sigiriya into a complex city and rock fortress. Kashyapa ruled from a magnificent palace in the sky. Building a palace at the top of a 200 metre high rock was no easy feat, although the king was extremely wealthy. An army of over one hundred thousand men, hundreds of elephants, and a workforce of skilled labourers constructed the fortress on top of the rock. 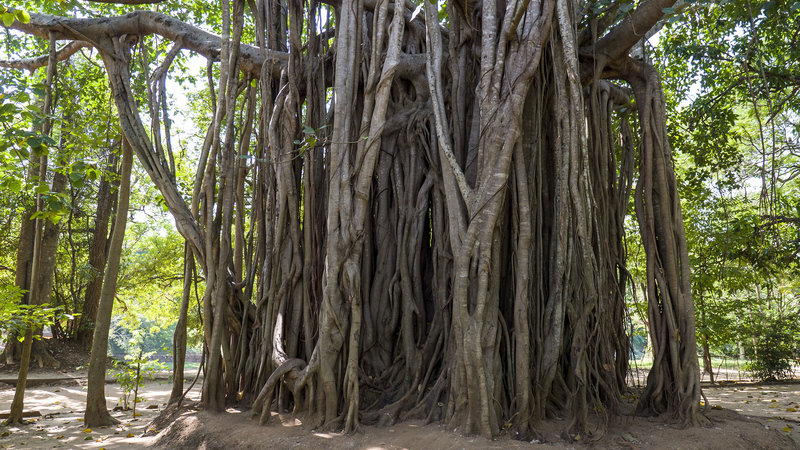 When Moggallana eventually killed Kashyapa, the capital moved back to Anuradhapura. 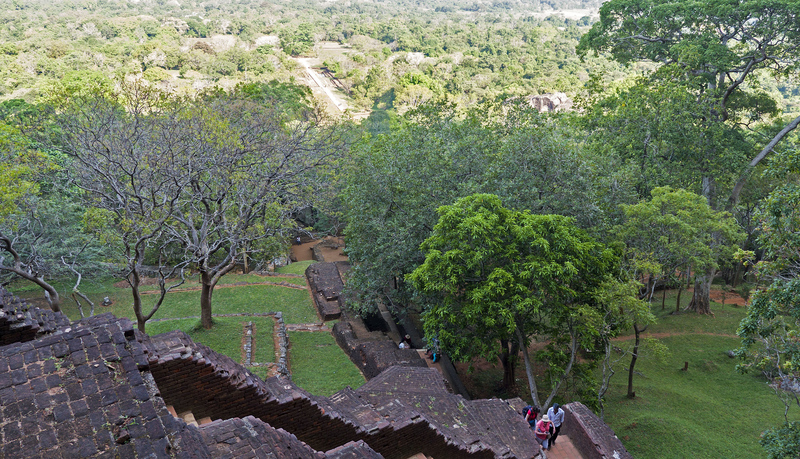 Sigiriya became a Buddhist monastery before it was abandoned. The British rediscovered the site in the 1800s, and a major excavation commenced in 1895. 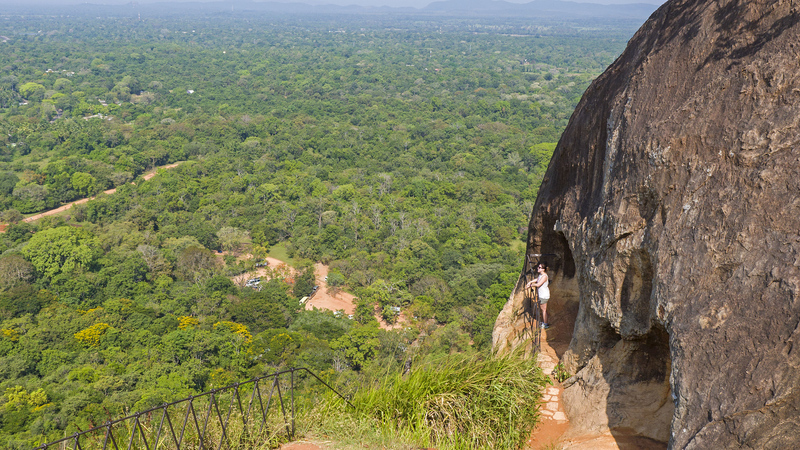 The main purpose of visiting Sigiriya Rock is to climb to the top. You’ll want to discover the remains of this impressive ancient palace and enjoy the spectacular 360 degree views of the countryside. I suggest arriving early in the morning and climbing as soon as possible. The site opens at 7:00am, and you should aim to get there as early as you can. 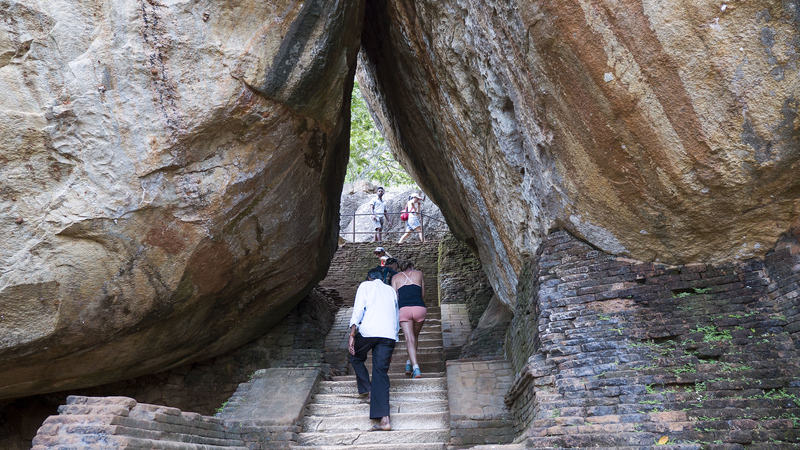 Not only does Sigiriya Rock get busier as the day goes on, but the weather gets hotter and hotter. When I visited Sri Lanka in April, it was incredibly hot. Every day, it was a stifling 38 degrees Celsius. Pack lots of water, sunscreen, sunglasses and a hat. If you can’t make it in the morning, aim to go in the late afternoon. Just try not to visit when the sun is at its brightest and hottest. I’m not going to lie; the climb can get fairly intense. It’s about 1200 steps to the top, and there are a lot of stairs. However, the climb isn’t dangerous. There are staircases and railings everywhere. The most difficult part of the hike is battling the heat and the sun. Pace yourself and drink lots of water. The hike is not very treacherous. 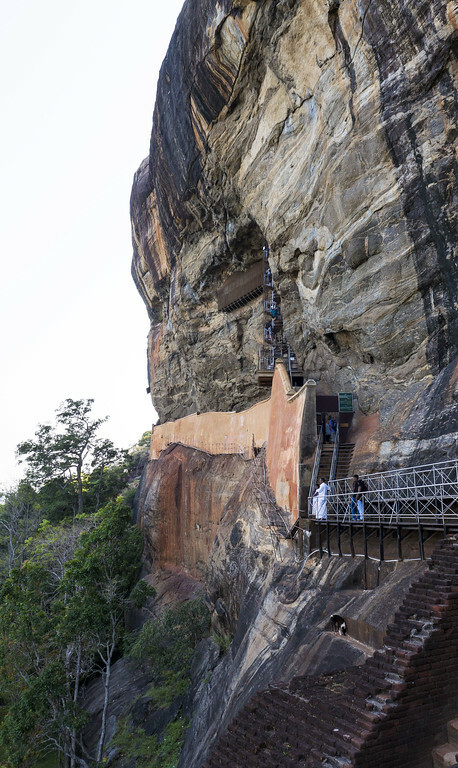 Almost anyone can visit Sigiriya Rock if they take it slowly. I saw school children making the climb, as well as senior citizens. 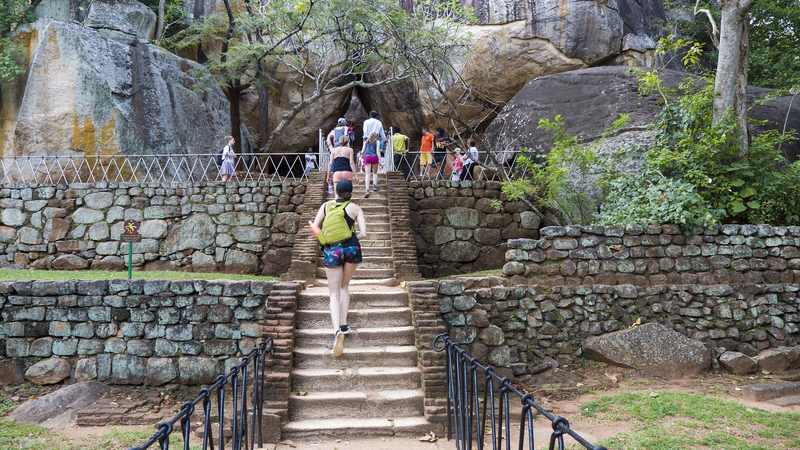 The climb to the top of Sigiriya Rock takes a long time because there are so many opportunities to stop and take photographs. After a couple sets of stairs, there are platforms featuring gorgeous views. You’ll want to stop at each one to admire the scenery as you ascend up to the top. Sri Lanka has a problem with stray dogs. Dogs are everywhere. They’re very cute to watch, although it’s troublesome that their populations have run rampant. 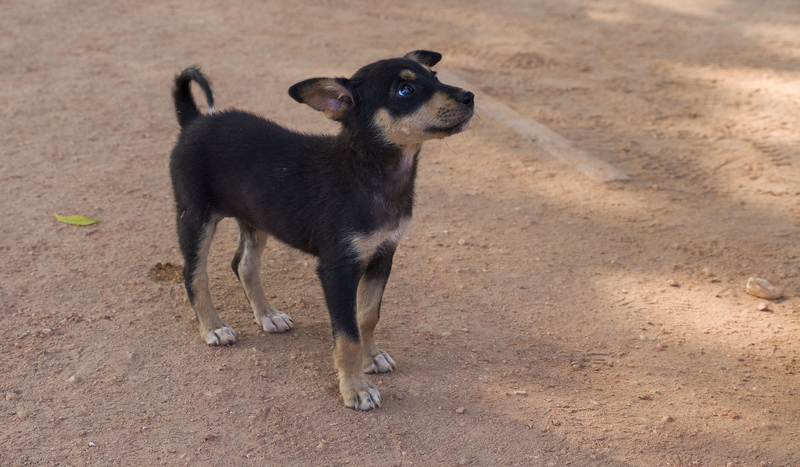 There are so many dogs and puppies wandering around the base of Sigiriya Rock. Some dogs even find a way to climb up the stairs to high places. 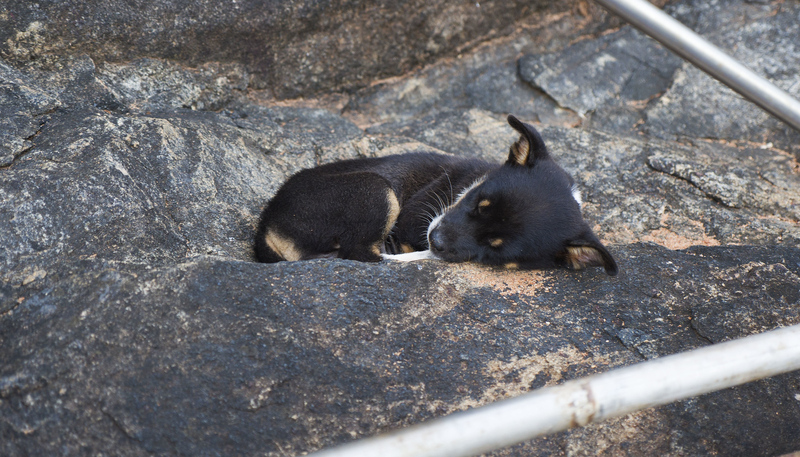 I was astonished to find puppies sleeping on the rocks at higher elevations. It might not look like much from here, but the dog pictured above is sleeping on a rock halfway up the Lion Rock. 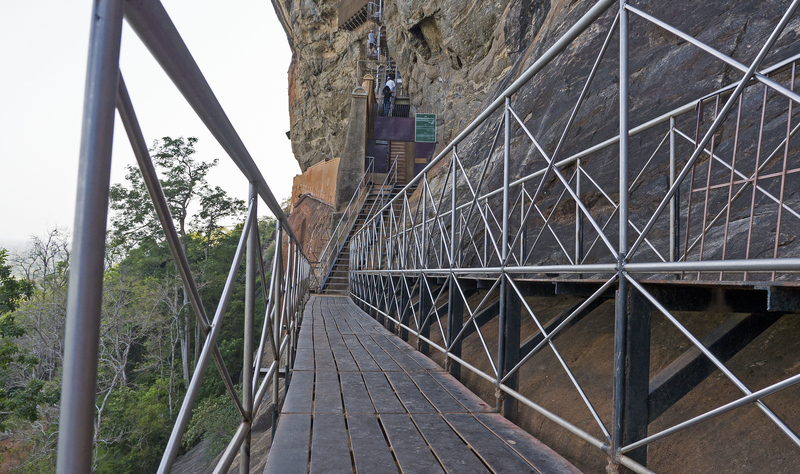 The Mirror Wall, now stained orange, used to be a highly polished white wall wrapping around the edge of Sigiriya Rock. It used to be so shiny that you could see your reflection in it. The Mirror Wall became permanently etched with phrases and poetry by visitors to Sigiriya, dating back to the 8th century. To protect the ancient inscriptions, writing on the wall is now banned. It might be one of the oldest examples of graffiti. The etchings on the Mirror Wall also prove that Sigiriya was a tourist destination even back then. After each set of stairs, there was a platform to rest, take pictures, and admire the scenery. Thankfully, the towering rock keeps many areas shaded from the hot sun. On the northern side of the rock, you’ll find the main entrance to the palace. You can’t miss it – you’ll see huge lion paws. Once an entire stone lion, only the giant lion paws remain on either side of the staircase today. It’s called the Lion Rock due to the massive lion feet. I found this last portion of the climb to be the most strenuous. The hot sun was beating directly down, and there wasn’t any reprieve from it. I had to stop on a couple of occasions on the staircase to drink some water and catch my breath. Even though the sun was extremely hot, the view made up for my discomfort. At last, I made it! 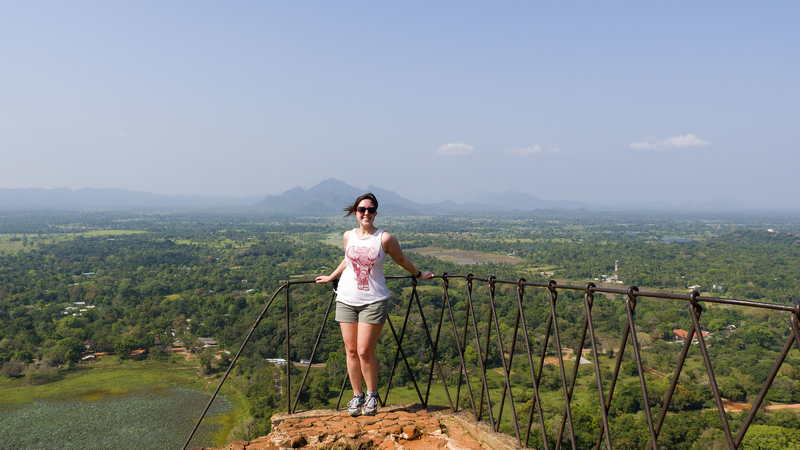 I felt really accomplished when I reached the top of Sigiriya Rock. At the summit, there are the remains of the king’s ancient palace complex. Excavations here are still ongoing. You’ll see the outlines of past structures, an organized system of cisterns, and even an ancient throne. The most impressive feature of all? The view. 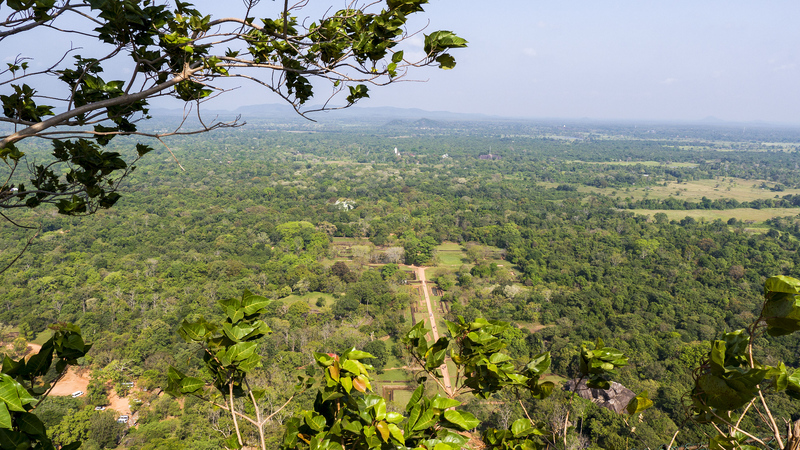 From the top of Sigiriya Rock, the view is perhaps only rivaled by the one from the nearby formation, Pidurangala Rock. From up top, the breeze wicked away any sweat from my body. It was so refreshing. I walked around and soaked up the scenery as much as possible. Every angle showcased the natural beauty Sri Lanka’s landscapes. From the countryside to the jungle, everything was so green. Beyond this orange rock, shades of green swept right up to the horizon. With mountains looming in the distance and standing at the edge of the rock, I felt like I was on top of the world. 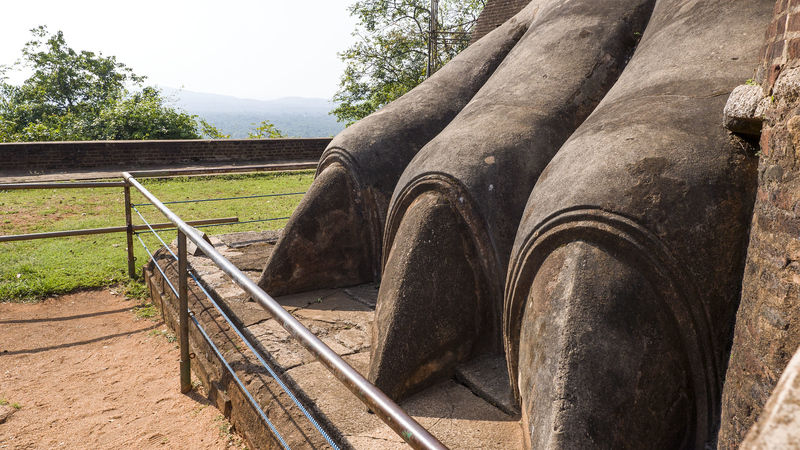 Besides the actual rock itself, the site of Sigiriya has several notable places to check out. 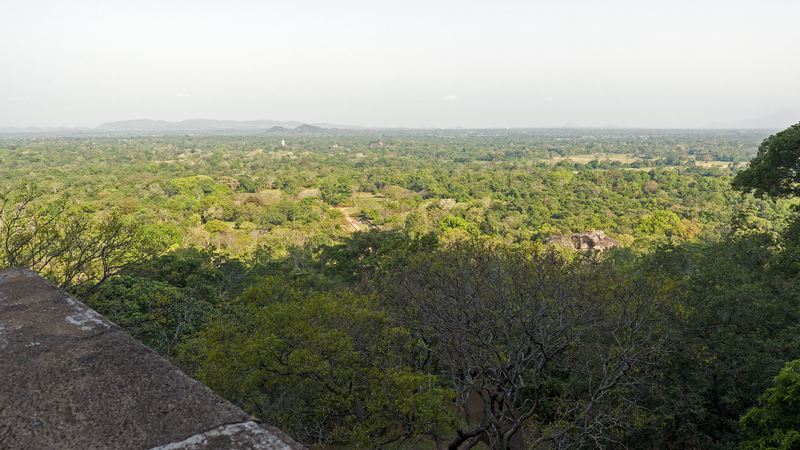 Sigiriya has some of the oldest landscaped gardens in the world. There are water gardens, cave and boulder gardens, and terraced gardens. They even have a complex irrigation system, consisting of canals, locks, fountains, and underground water pumps. When it rains, the channels fill and the water circulates throughout Sigiriya. There’s also a museum at the base of Sigiriya Rock that’s very informative and insightful. The museum details the history of the rock and the region. Everything is included in the price of admission, which is $30 USD for foreigners. There’s also a couple of small souvenir shops on site, as well as a concession stand selling water if you run out. I stayed just outside of Sigiriya at Mahagedara Retreat. We traveled by car from the retreat and we returned via tuk tuk. There are dozens of tuk tuk drivers waiting at the entrance of Sigiriya to transport you back to your hotel. 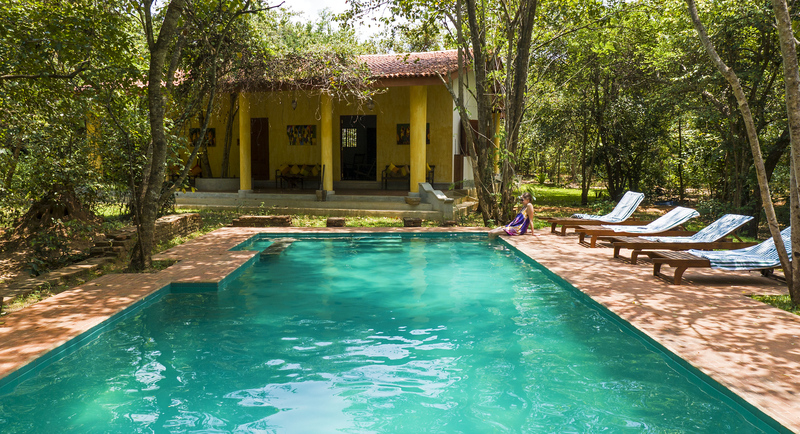 Mahagedara Wellness Retreat is a peaceful sanctuary in the middle of the Sri Lankan jungle. Enjoy the perfect balance of pampering and going on adventures. 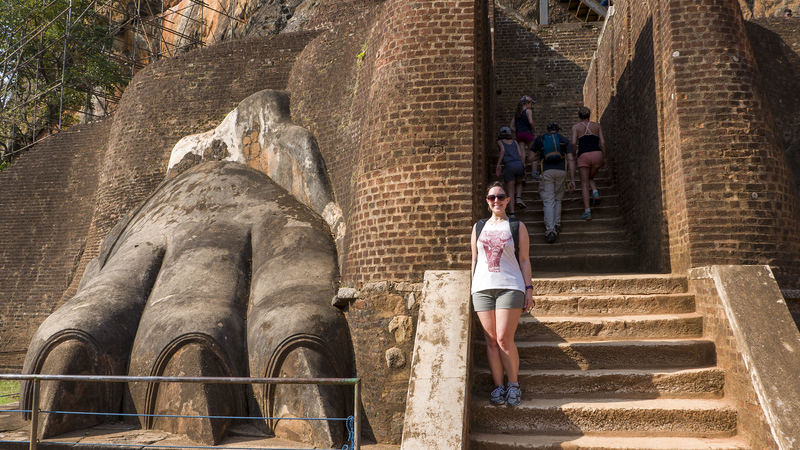 I enjoyed days filled with excursions (like this one to Sigiriya Rock), practicing yoga, swimming in the pool, eating delicious food, and relaxing at the spa. Check out my full review of Mahagedara Retreat, and book your stay through Booking.com or Expedia. 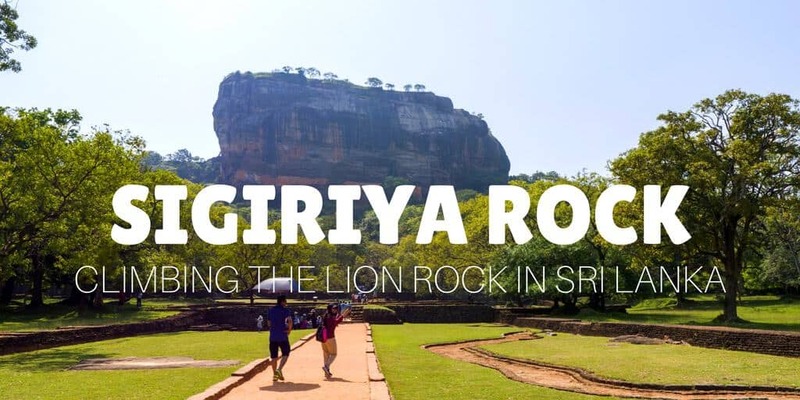 Sigiriya Rock may be one of the most touristy spots in the country, as well as one with the most expensive admission cost. However, it’s well worth visiting and I highly recommend that you check it out. 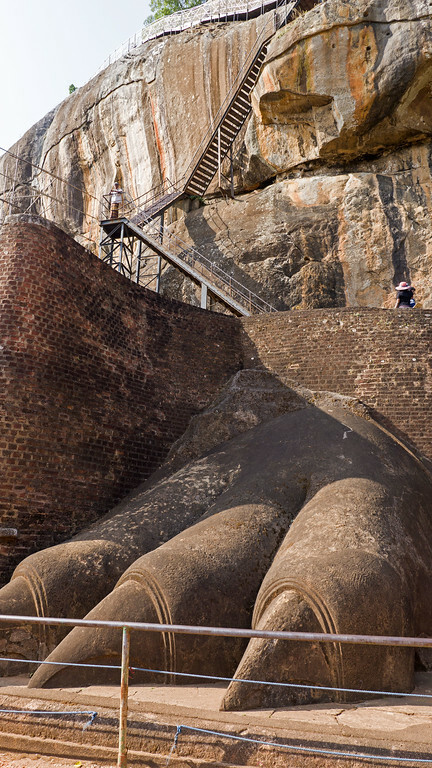 It’s one of the most impressive historical and natural places in Sri Lanka. 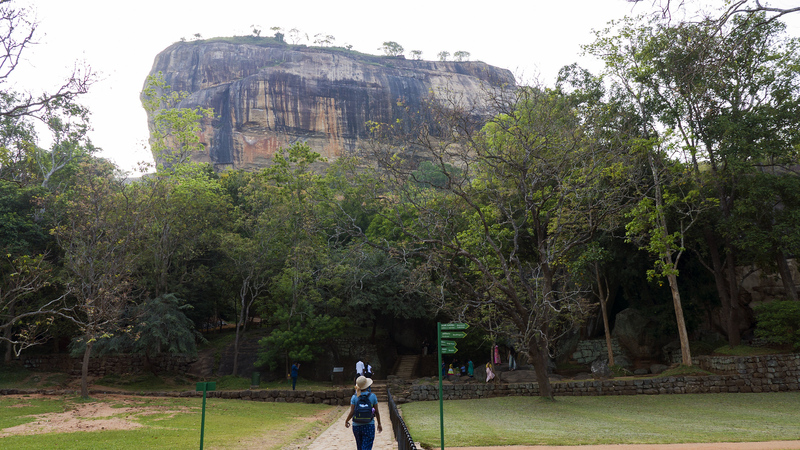 View more photos of Sigiriya Rock in my Sri Lanka travel photo album. I don’t think I could do this, and it’s not because of all the stairs. I would try to take ALL the puppies home. Other than that, this looks like a cool adventure, with an awesome view as a reward. Some great pics. Sri Lanka was on our wishlist for 2017 but I doubt if we’ll make it this year. We really want to go soon especially after reading this. Gorgeous photos. I’ve never been to Sri Lanka, but the dogs of Sigirlya Rock remind me a bit of Malaysia’s Batu Cave monkeys. Cute to look at but dangerous if you get too close. I was just in Sri Lanka a few months ago and I really love it! I stayed with a local family and enjoyed the nature! 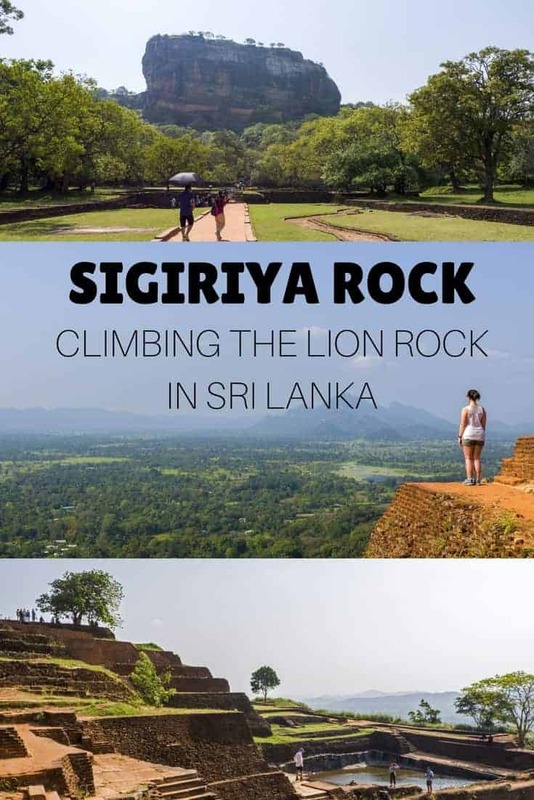 Too bad I was not able to go to Sigiriya Rock! Wow what a way to spend a day – Sigiriya Rock sounds like a fantastic experience, it’s funny, my dad has developed a passion recently for stair climbing, and just registered to climb in Switzerland next year, 11,000 stairs lol so 1200 for Sigiriya Rock we can manage :D The views are incredible, and I think many people would still climb just for that, but massive bonus that it has such a rich history as well as the site of the palace. Thanks for the tip on heading there early morning – we usually do this for the crowds, but avoiding the heat of the day when climbing is a very good point too! Well done! I’m not sure if I can do that climb as I might pass out on my ascent. LOL! The view from the peak looks so stunning and definitely worth it. I enjoyed the photos more than anything else. Posted Sri Lanka on my “to-go” list, going there very soon. I like your story and pictures. thanx for capture and sharing with us this beautiful scenes. 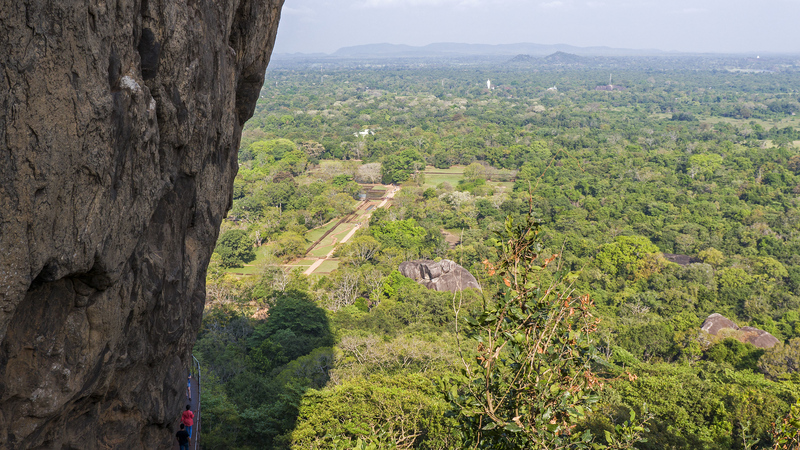 An absolute highlight of Sri Lanka – this is a “must do”. Be aware that you will have to climb about 1,000 uneven steps to get to the very top. It is well worth it once you get to the top to soak up the history, the civil engineering (what is left of it) and the incredible views. This place looks so stunning! Such perfect timing as we will be there next week! Thanks for this post!